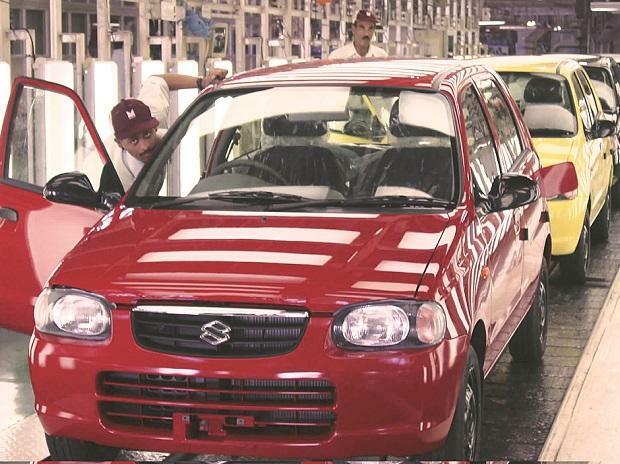 The country's largest carmaker Maruti Suzuki India (MSI) on Wednesday cut its sales forecast for the ongoing fiscal to 8 per cent from an earlier projection of double-digit growth. The company cited low demand in the second half of the year due to high interest rates, increased insurance cost and fuel prices for its downward revision, besides its lack of new model launch in the volume segment. Citing historical instances of sales being lower in a pre-election year and picking up substantially again in the election year, the company said it is hopeful of better sales in the next fiscal. Interacting with reporters here, MSI Chairman R C Bhargava also said in preparation for the transition to BS-VI emission norms, MSI will stop production of a majority of its BS-IV models by December 2019. "In the last five months after the first quarter, sales have been flat for Maruti while the industry saw negative growth. The question, therefore, is what happens next," he said. Bhargava said the company is also offering attractive packages to customers to push retail sales in December to reduce dealer inventory, which coupled with a new model launch planned in January-March 2019, would help MSI reverse the trend of declining sales. "In the wholesales, we expect sales to go up by 5 per cent in the January-March quarter," Bhargava said. In the first half of the fiscal, the company had posted sales growth of 10.5 per cent, whereas it was flat in the third quarter. "So, we are looking at a growth of around 8 per cent for the ongoing fiscal," he said. Earlier this year, the company had said it was looking at a double-digit sales growth in the current fiscal. MSI Senior Executive Director (Sales and Marketing) R S Kalsi said external factors such as higher interest rates, fuel prices and increase in insurance cost at the time of vehicle purchase had affected consumer sentiment, thereby impacting demand. "Internally, we also had to cut down production of the old version of our best selling MPV Ertiga ahead of the launch of a new version," Kalsi added. Giving a historical perspective of passenger vehicle sales in a pre-election year, Bhargava said, "We have done an analysis of the past numbers and the conclusion is that in the last two pre-election years sales always fell." He further said: "In the election years, sales always go up substantially. So next year we have to see." Bhargava said MSI's sales growth has also been partly affected this year due to the absence of a new model launch in the volume segment. "In the January-March period of next year, we will have a new model which will again push volumes for us," he said, adding that the newly launched Ertiga would also contribute substantially as it has been received well in the market. According to Kalsi, Ertiga has received bookings of 23,000 and currently has a waiting period of eight weeks. Commenting on the company's plans for transition to BS-VI, Bhargava said: "Our plan is for all new models to be introduced in the next financial year to be BS-VI. Production of a majority of the existing BS-IV models will come to a stop by December 2019." By and large, BS-IV vehicles will be produced only on demand from customers from December 2019, or in case the company feels that it can manage the time of distribution and registration of such vehicles ahead of the deadline, he added. The Supreme Court had ordered that sales of all BS-IV vehicles will stop from March 31, 2020, and from April 1, 2020, only BS-VI vehicles would be sold across the country in the wake of increased pollution issues. When asked about the company's plans to shift its main plant at Gurugram, Bhargava said it is still in talks with Haryana government for an alternate location. "As of now there is no progress on that front," he said. MSI CEO and Managing Director Kenichi Ayukawa said the company is considering an alternate location only within Haryana and not in other states considering the presence of its supplier base in the state.